If you want to play slots online then this is a fun one to start with. 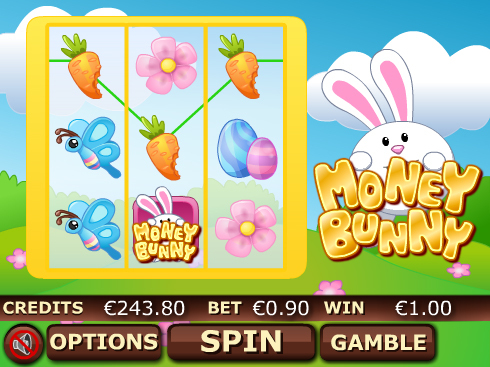 Enjoy this cute and cuddly 3 reel bunny themed online slot. The simplicity of 3 reels allows a much more relaxed and enjoyable gameplay experience. Match carrots and butterflies to win yourself some free spins and bonuses. This title was developed and published by EyeCon, an Australian company that delivers great titles to the casino gaming market since 1997. Cheerful, fun and attractive slot games like Money Bunny is what made them famous in the digital gaming sector, with over 100 titles in their portfolio, all of them being designed for entertainment, with stunning graphics and top notch gameplay and animations. Getting you to read more and enjoy every single spin is their focus, as this game-development company has invested a lot in highly-skilled professionals specialized on 2D and 3D graphics. This game delivers a high level of entertainment within a clear, concise and crisp design. Cuteness overload! Prepare yourself for a cuddly huddle of irresistible fluffy bunnies ready to give you amazing prizes, only with Money Bunny slots game from EyeCon. Engage your inner kid in a trip to a fictional, childish universe. With the game frame laid on a background that has as a main composition a hilly green landscape and the blue horizon of a sunny day, that contrasts with the tiny little beautiful pink flowers spread on the whole field. The “aww factor” is strong with this one as there are loads of cute fluffy rabbits there to entertain you. Enough chit-chat, let’s just get into the gameplay! This 3 reels, 9 paylines slots game, is fairly common for the guys at Eyecon, has a basic principle of lining up identical symbols in activated paylines in order to trigger whooping cash prizes. If you are feeling lucky, then you can double (or lose) your stake by gambling, as this game has this feature as well. Apart from these features, the game also comes with great bonuses such as wilds, scatters and free spins for you to enjoy. The logo of the game, Money Bunny represents the wild card of this title, and substitutes for all items apart from the scatter. Get into wild combos and earn up to 1000 points. When it comes to scatters, the scatter rabbit triggers bonuses even without forming combos, so find a minimum of 3 scatter symbols in order to win 8 free games and get a chance to triple your prizes as you trigger the free spins feature. Last but not least, there is yet another scatter that is represented by the Easter basket and it behaves pretty much like the other scatter, but only that, instead of free spins you will be given the chance to a mini-game based on the pick-and-win concept. basket and it behaves pretty much like the other scatter, but only that, instead of free spins you will be given the chance to a mini-game based on the pick-and-win concept. While in this mode, make sure you pick wisely, as you can multiply your stake by 111x times. Lucky for us to play this by Easter, but trust as that it does not matter when and where you play it because you’ll have your eyes shining and your mouth aww-ing at these fluffy and cuddly rabbits, always there for you with amazing prizes and bonuses. Given the fact that this is an fun, attractive , yet easy and intuitive slots game, we can say that Money Bunny is a game to entertain both, a beginner and a professional player. Another cute game is Fluffy Favourites. Looking for more slot games? Click here.